A balance of television brilliance. Upon first airing, this episode didn't do too well against the competition, but when NBC repeated it eight months later "Balance" easily won its time slot. (The word was getting out.) The "trade papers" estimated that about 21.3 million people witnessed a replay of a certain space conflict (impressive numbers when you consider that this was a summer rerun). I should note that here in Canada our viewer numbers were not factored into the ratings. Star Trek was considered a "hit" on CTV here in the Great White North. "I wish I was on a long sea voyage somewhere. Not too much deck tennis, no frantic dancing. And no responsibility... Why me, Bones?" Brilliant comment, as usual, Barry. This is an amazing episode of Star Trek!!! John great review. 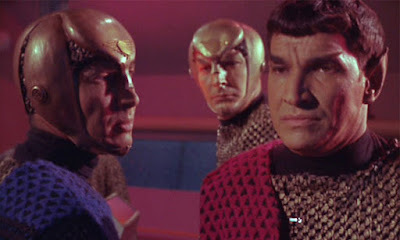 "Balance of Terror" is one of the best episodes of any Star Trek series. It even rivals any Star Trek film. The Kirk's 1701 v. Romulan was replicated in STAR TREK II:WRATH OF KHAN Kirk's 1701-Refit v. Khan's Reliant. I totally agree with you, SGB! This episode is tops, and does rival the movies. A great show! Not much to add. Great commentary on a great episode. Here's another bit of fun trivia: "Balance of Terror" was the seventh episode filmed (after the second pilot). "Shore Leave," which aired the week after "Balance," was the fifteenth in production order. Barbara Baldavin, who played Angela Martine, appeared in both episodes, as the same character. In "Shore Leave," she appears to be romantically involved with Lt. Esteban Rodriguez. Due to this discrepancy in production order vs. air dates, it must have seemed to viewers in the 60's that it took Angela no time at all to get over poor Lt. Tomlinson! Shatner is allowed to ham up a few scenes (he gets that "lighting stripe" treatment occasionally, like in the chapel when Angela stops to pray), but it's Shatner's subtlety that makes this episode. For example, he has to tell the crew he commands (and loves) that they are expendable. 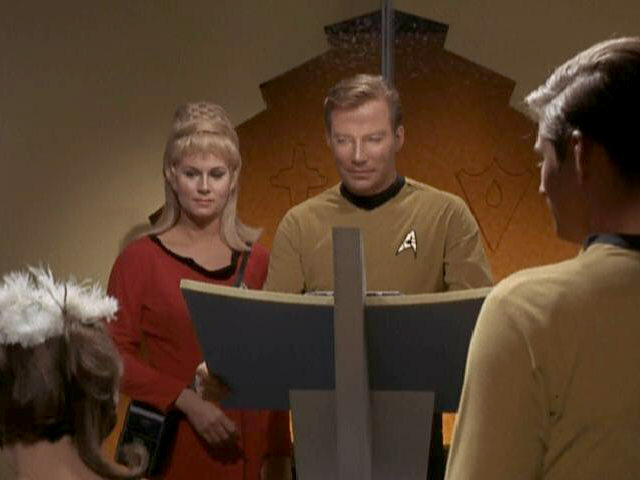 Picard would have made it a lecture, Kirk rushes through the syllables and slammed the panel quickly to end the message. 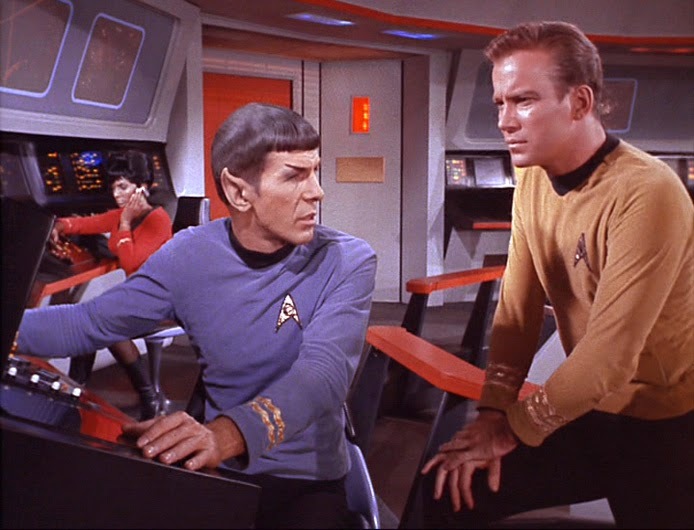 Then, despite this order, Kirk later calls to tell Starfleet that they are about to enter the Neutral Zone. He is exercising his judgement, when his judgement could end his career, destroy his ship, or cause intergalactic war. He has to be stoic, because he can't show weakness. 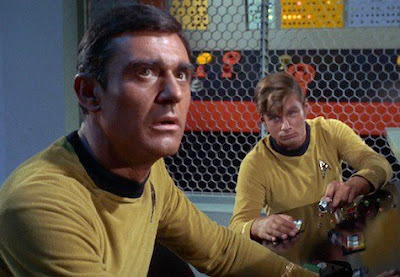 At the very end, Kirk can relax and show a smirk over Starfleet, from their safe position in the rear, accepting Kirk's judgement. I'm not fond that the other characters don't seem to react, but Rand's apparent anger is understandable: first, she's expendable and then Kirk has to go out past the net on his own. It has been a year since I binge watched TOS. This is one of the episodes that stick to your mind! If only seasons 2 and 3 were as good as season 1. For me, perhaps the finest moment in Shatner's performance is the very end as he exits the chapel, his back stiffening and his shoulders straightening with every step as he continues down the corridor among the crew. Is there any better symbolism of the weight of responsibility that accompanies the authority such a decision maker must accept? This episode forces the audience to think about what at first seem obvious points but really are not. 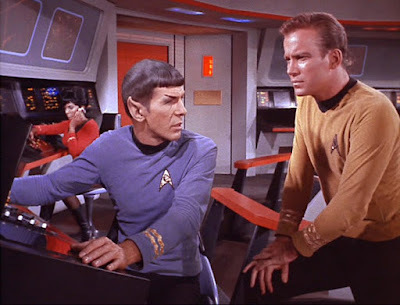 We understand that of course Stiles must rethink his prejudice in the face of Spock's heroism, but Kirk's insistence that he keep his prejudice out of his behavior on the bridge is not an admonition against all contrary thought. 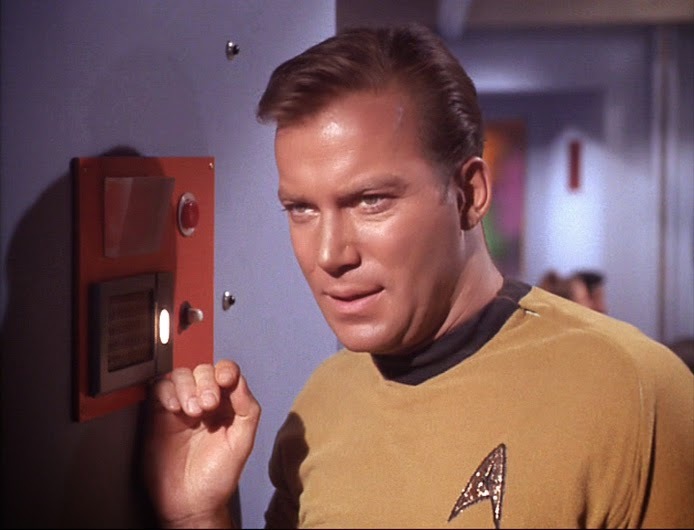 That would be the easy way out, but Kirk doesn't want or need sycophantic thinkers, he just needs to be able to rely on people whose point of view is not suspect. That's a very "adult" viewpoint that rejects the easy and obvious. This is confirmed when Spock, in the most surprising moment of the episode, concurs with Stiles' analysis ("I agree: attack.") because he comprehends the enemy's nature in a way nobody else on board can. Thus, the audience must contemplate the fact that Stiles' strategy is correct although his judgment and reasoning are poor. The only complaint I have about "Balance of Terror" is that it insists, like an oceanic submarine battle, on battles occurring in two dimensional planes. Too many space battles, on TV and in movies, follow this standard, except in rare circumstances. A classic episode on the futility of waging war and clashing political ideologies. Most of all, an episode that clearly depicts the following. Despite being on opposite sides of the fence - in this case the neutral zone - when you get right down to it, both sides are not so different and not so anxious to 'push the button'.